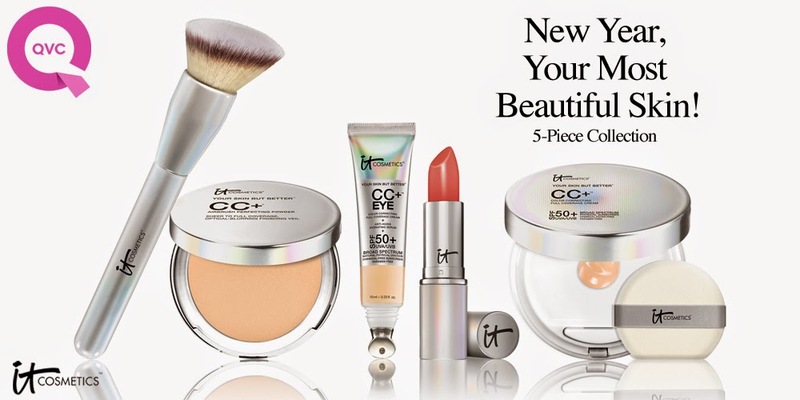 IT Cosmetics Anti Aging Full Coverage CC Cream 50 SPF ($38) ok What? Is this a concealer? A BB Cream? Huh? Not going to lie I've been using this as a concealer when it's NOT a concealer it's a full coverage CC cream. This is basically a concealer but can go over your entire face to cover up imperfections and blemishes. CC= Color Correcting. (Age Spots, Redness, etc) This was formulated by a plastic surgeon and is a serum, moisturizer all wrapped up into this little bottle. Wow. Try like 4 different products in one tiny bottle AND you can use it as a foundation. My jaw has dropped. 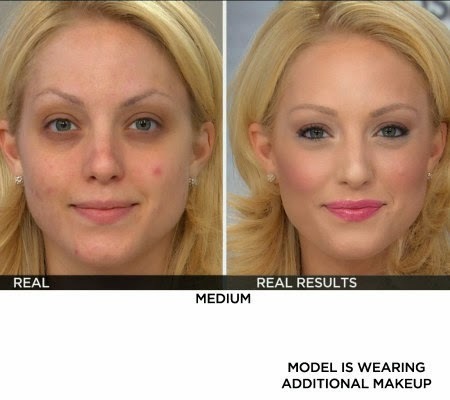 This before and after picture has got me a little jaw dropped as well. SPF 50 too- this can be doubled up as a sunscreen, so this is perfect if you're going to be out in the sun all day but still need a good foundation. (5 piece set available at QVC, which contains everything I reviewed) If you've seen IT Cosmetics in your local Ulta store, one of the things you probably first noticed is their beautiful plush brushes. It was the first thing I was drawn to, but the price made me back away a bit. My favorite brush is the Heavenly Luxe Angled Brush ($38), one of their bigger selling items. Not only is it gorgeous, but it works well for sculpting, powders, foundations and your blush. I have been pairing my new brush up with the CC+ airbrush perfecting powder which is a little compact with a gorgeous powder, SPF 50 just like the CC cream; meant to create a sheer glow. This feels like a powdery velvet dream which covers all flaws and imperfections. Using this OVER the CC+ Cream makes the results even better. It doesn't apply thick, and it doesn't cling to your pores. I'm not sure if this one of a kind powder is exclusive to QVC, or if it's available on the IT Cosmetics site. Either way, if you're looking for a powder full coverage foundation this is the perfect solution. And at $38 the price is about average. The Airbrush Perfecting Powder reminds me of something you would apply right before you are taking a picture to make sure the red spots don't show up. 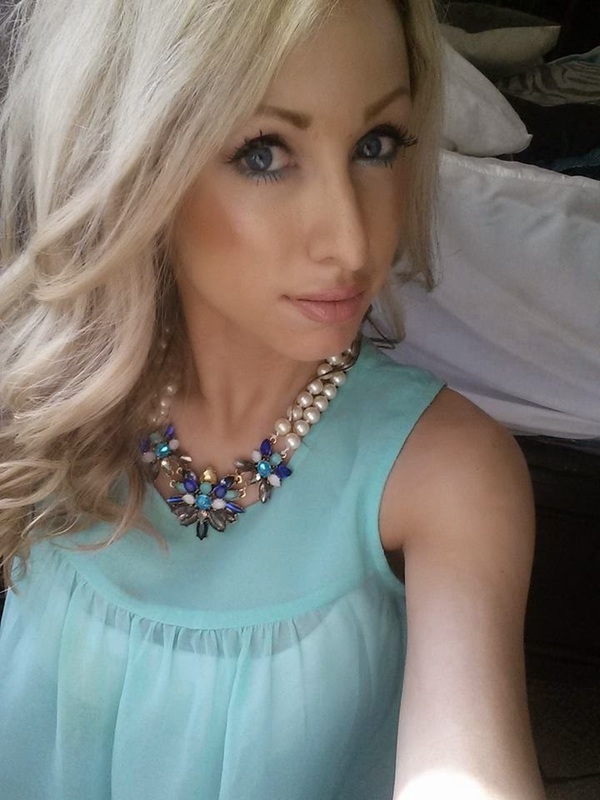 Just think of possibly Instagram or picture apps that let you airbrush your picture. Well you don't need that with this flawless full coverage powder. And if you don't fancy powder, (really depends on my mood) It Cosmetics has not left you out. 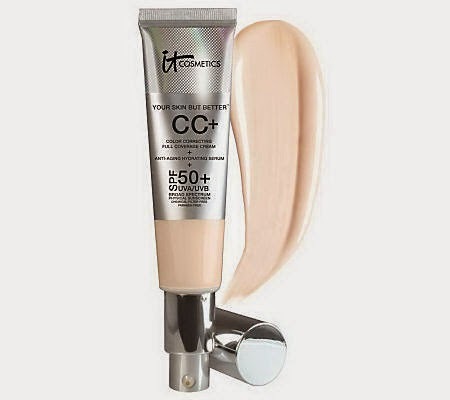 They have also created a CC+ Color Correcting FULL Coverage Anti- Aging SPF 50 Cream Foundation ($38) for people that are more on the possibly dry side that like that creamy touch to their skin. This cream foundation creates a dewey luminious glow finishing touch to your face. It covers all imperfections and claims to leave your skin flawless. I love the concept, it's unlike anything I've seen before. It's a fluid in a compact but you hit the little button for the foundation to squirt out, and then they give you a little sponge to collect just the right amount of product needed so you don't waste any. Genius. When I ordered this I was extremely pale so I chose "Light" but I have since gotten a tan so it's a little light on my skin. Both the powder and foundation cover up all my freckles, sun spots, acne scars, everything. If I was going to do a movie TOMORROW, I would want this type of airbrushed look. My skin has never looked more smooth, dewey, moisturized, I could go on and on. I was also extremely tired when I took the below picture, and take note, NO dark eyes, circles, nada. 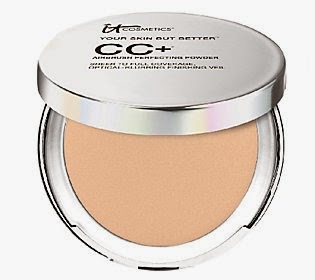 It is just like the CC Cream in that it is a moisturizer and color packed into one compact. So the end result is YES IT Cosmetics is a little more expensive then what I like to usually pay for, BUT I have been doing it because the results are really worth what you're getting. IT Cosmetics really does their homework when it comes to research and talking to doctors, scientists, and coming up with the right makeup to make you look fresher and younger. And that is the main reason I will continue to buy their makeup. I can't wait to see what they come up with next. Follow them on Twitter, Facebook and make sure you check out their site. Can I give it a higher letter??? I love It Cosmetics. Their products are amazing! Wow, the results are amazing. I'm so curious about this now.